With the first Match Day of Asia's World Cup qualifiers over, we take a wee step back to round up the day's action and provide some thoughts. For a preview of the final round click here. The first game of the day saw Japan taking on unfancied Oman in group B's opener, the venue was the Saitama stadium where 63,551 packed in to watch the drama unfold. Japan took early control of the encounter, with slick passing and movement being the order of the day. The trend continued for the duration of the game and was almost absolute; with Oman offering little to quell the waves of attacks. Honda's return to the side was a fruitful one, he scored the first of the game, with Maeda & Okazaki both getting on the score sheet in the second half to wrap up the 3 points with a deserved 3-0 victory. Importantly the presence of players such as Honda, the instrumental Kagawa and Okazaki really showed the chasm between the two teams in terms of ability. Oman were lacklustre and lacking in imagination, were it not for the brilliance of Al Habsi on several occasions the scoreline may well have been more embarrassing for Paul Le Guen's men. Then came Group A’s turn, Uzbekistan Vs Iran promised to be a physical encounter, and so it proved. Both teams started rather cautiously, but soon the game found a rhythm and Uzbekistan took hold of the encounter. Several times they found themselves through on goal, but Mehdi Rahmati was solid for Iran and kept the hosts out with some top notch goalkeeping. Queiroz’ men looked ragged and sloppy, but they weathered attacks from the Uzbek forwards whilst relying on some poor finishing also. Bearing in mind that Uzbekistan were missing 5 starters (due to getting themselves booked in the final game of the previous round to avoid carrying over yellow cards), the game seemed set for the men in white to seal all 3 points. 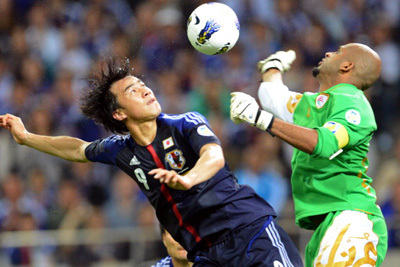 The second half followed the same pattern as the first, but controversy struck when Japanese referee Yuichi Nishimura disallowed a goal for Uzbekistan which seemed clearly over the line. The goal line technology camp with another piece of evidence to add to the pile. However when a team doesn’t take chances, they inevitably come to rue them, and in the 94th minute possibly the biggest sucker punch of the year in football terms came when Khalatbari slotted in for Iran after a well executed counter attack. A thoroughly undeserved 3 points for the visitors, but important ones nonetheless. From Uzbekistan’s perspective, it was a bitter blow to lose the game which should have been easily one, but they can take pride in the performance and if they repeat such performances surely they will be in with a clear shout for a first World Cup appearance. Update: In a seemingly knee jerk reaction the UFF has sacked coach Abramov and replaced him with Kasimov, it’s difficult to ascertain if there were long term reasons for this change, but this may pose a further challenge for the White Wolves. The third game of the day saw the first Middle Eastern derby of the final round. Jordan Vs Iraq was billed as a fiery rivalry, and the game began at a searing pace. The fans were raucous in Amman, adding to the intensity of the occasion, but it was Iraq who drew first blood, a long ball forward controlled by Younis Mahmoud who then laid it on for midfield maestro Nashat Akram who ran at the defence, turned the defender and slotted low into the far corner. Jordan’s response was unconvincing and it took half an hour for an equaliser to arrive. Baha Suleiman with a speculative effort from well outside the box, which was badly mishandled by Gassid who could only roll it into the path of Ahmad Ibrahim, the striker did not hesitate to capitalise, and thus the first half ended 1-1. The second half was a far cry from the first, apparently the intensity of which had drained the players, and the game devolved into a slow and laborious affair. Hamad made several changes in the second half to no avail, while Zico waited until the 88th minute before bringing on fresh legs in the form of Mustafa Karim and Alaa, but it was too little too late and possibly indicated Zico was content with the draw. The day’s final game saw Lebanon host Qatar in Beirut. Both sides started well with the woodwork being struck at both ends, however it was to be a terrible defensive error which settled the score. Lebanon’s Ramez Dayoub with a horrific back pass into the path of Qatari striker Sebastian Soria, who made no mistake in punishing the hosts. That sums up match day 1 for us. There will be four more games on Friday, join us for some coverage on twitter & match day 2 round up here on sandals for goalposts.